Nyogen Roshi is a successor of Maezumi Roshi, who brought Japanese Zen to the United States in 1956 and was widely considered the foremost Zen master of the 20th century. Nyogen Roshi was the last of only a dozen students authorized by Maezumi Roshi to succeed him as a teacher. Nyogen Roshi studied with Maezumi Roshi for 27 years. Honorary founder of the Hazy Moon Zen Center, our teacher’s teacher, and one of the most significant forces in Zen Buddhism of our time, Maezumi Roshi was born in 1931 to the Kirigaya-ji temple-household of Baian Hakujun Kuroda Roshi, one of the leading figures in Japanese Soto Zen. Maezumi Roshi was ordained as a Soto monk at age 11 and studied Oriental Literature and Philosophy at Komazawa University. He completed his Soto monk’s training at Sojiji monastery and in 1955 received Dharma Transmission from Hakujun Kuroda Roshi. He later received teacher approval (Inka, and the title Roshi) from both Hakuun Yasutani Roshi and Koryu Osaka Roshi and thus became a Dharma successor in three Zen lineages, a rarely encountered achievement. 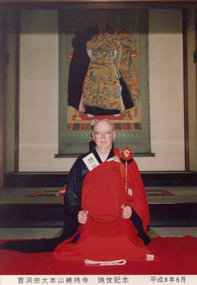 Maezumi Roshi came to Los Angeles from Japan in 1956 to serve as a priest at the Soto Headquarters, Zenshuji. In 1967 he established the Zen Center of Los Angeles and dedicated it to his father as the honorary founder. For the next 28 years Roshi worked tirelessly to lay down a robust foundation for the development of Zen Buddhism in the west. He ordained 68 priests and gave lay precepts to over 500 people. His clearly articulated goal was to cultivate western Zen teachers so that the Buddha Way might flourish in its natural western expression under their guidance. He transmitted the Dharma to 11 successors, a group he designated the White Plum Asanga, named in honor of his father Baian Hakujun (whose name means white plum). Maezumi Roshi also established six temples in the west and formally registered them with Soto Headquarters in Japan as well as The Kuroda Institute for the Study of Buddhism and Human Values. The Kuroda Institute, founded in 1976, is an educational organization that promotes Buddhist scholarship. It is particularly well regarded for its East Asian Series published by the University of Hawaii, which includes works by some of the foremost Buddhist scholars in the United States. Maezumi Roshi received Dharma Transmission through three lines of Zen, a rare achievement and contributor to the breadth and power of his teaching. As our ancestors, Maezumi’s three teachers are embodied in the practice tradition at the Hazy Moon. Kuroda Roshi, Maezumi’s father, was a prominent Soto priest and 36th Abbot of Koshinji Temple in Otawara City, Tochigi Prefecture, Japan. He was also chief justice of the Soto Sect Supreme Court, which adjudicated internal matters within the Soto institution. As was customary in temple families, Kuroda Roshi ordained Maezumi at the age of 11. Kuroda Roshi gave Dharma Transmission to his son in 1955 after he completed Soto monk’s training at Sojiji monastery. As a young child, Yasutani had presentiments that he would become a Zen priest. At age five he began training at a Rinzai temple. Throughout his youth he was trained at various temples but also became a schoolteacher and elementary school principal. His formal training resumed when he was 40, under the guidance of Harada Roshi, who had studied with both Soto and Rinzai masters. He received Dharma transmission from Harada in 1943, at age 58. Believing that true practice was lacking in the Soto establishment, he formed an independent Zen organization oriented to lay practitioners called the Sanbo Kyodan. Although already a Zen priest and teacher in Los Angeles, Maezumi Roshi began studying with Yasutani in 1967, traveling frequently to Japan and hosting Yasutani in Los Angeles. He completed koan study under Yasutani and received inka, or Dharma transmission, from him in 1970. Yasutani became well known in the West through the book, The Three Pillars of Zen, which contains his introductory lectures on Zen training. Among the first instructions in zazen ever published in English, his lectures are the basis of the introductory meditation classes taught at the Hazy Moon. Koryu was a Rinzai teacher and successor of Joko Roshi, a reformer of Japanese Zen. 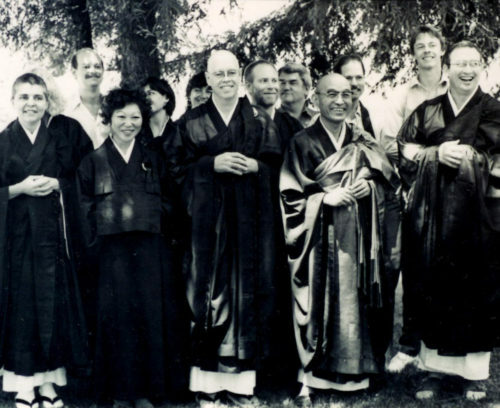 Rejecting the deterioration of institutional Zen, Joko Roshi founded a lay Rinzai practice group based in Tokyo, the Hannya Dojo, with a training center on Mt. Fuji called the Hannya Fuji Dojo. Emphasizing the vitality and simplicity of the true Zen spirit, Joko Roshi asked that Koryu Roshi never ordain. Departing with tradition, Maezumi’s father sent his son to live and train with Koryu Roshi while a university student, studying koans in the Rinzai style. 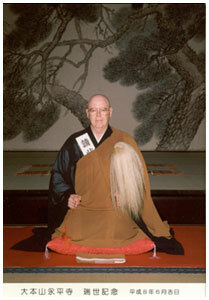 Maezumi continued his koan training with Koryu Roshi after arriving in Los Angeles as a Soto priest in 1956. Koryu Roshi began visiting Los Angeles for three months every year. He was revered by students for his powerful teisho and profound humility. In 1972, Koryu Roshi gave inka, or Dharma transmission, to Maezumi. Transmissions by these three masters—his father, Hakuun Yasutani Roshi and Koryu Osaka Roshi—confirmed Maezumi as an independent teacher and dharma successor in three separate lineages. Zen is a living practice transmitted one-on-one, face-to-face from a teacher to a student. The Hazy Moon is a lineage center, meaning that the Dharma expounded and maintained here has been handed down through a continuous line of ancestors from India to China, Japan, and America through Maezumi Roshi and his successor, our teacher Nyogen Roshi. 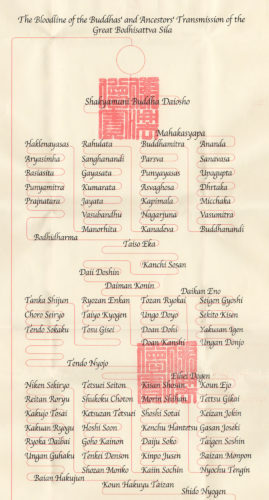 When you take Jukai at the Hazy Moon, you receive the kechimyaku, the blood lineage chart that depicts the transmission of the Dharma from the Shakyamuni Buddha down through 81 generations to you and back to Shakyamuni Buddha, a complete circle which is your own life.